Basil, the Great Mouse Detective! Gee, who are these mice? Oh, wait. I guess the disguise was too good. (snicker) Sorry, Basil. Well, I finally got around to this page!!! Basil is a cool little mouse. 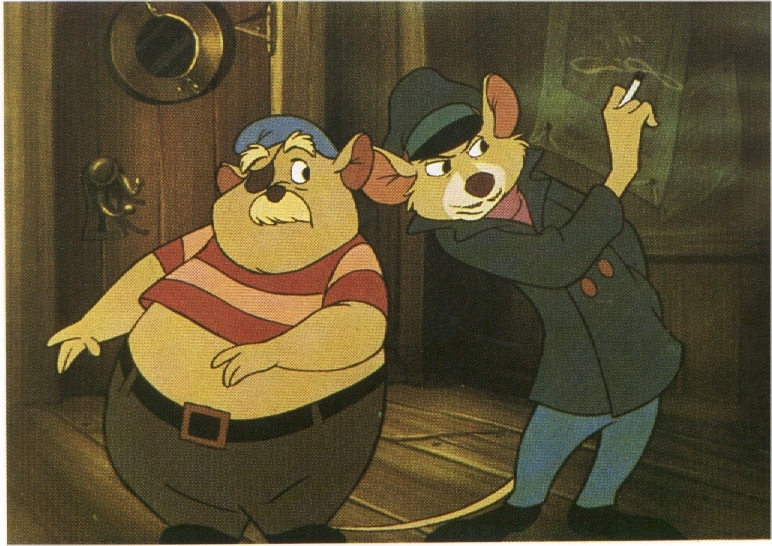 I didn't really like him until I saw the Great Mouse Detective (thank you, Tealin! ), and then I realized, hey, this mouse is the MAN! Well, sort of. So I immediately went out and found Basil of Baker Street at a bookstore, and became obssessed with this little guy. Eve Titus wrote the Basil books, which are really cool. There's Basil of Baker Street (duh), Basil and the Pygmy Cats, Basil in Mexico, and Basil and the Lost Colony. I may be leaving a book out, but I can't remember. Anyway, these books are a lot like the movie, except there's a lot more characters!!! Now, granted, these books are a little on the juvenile side, but you can deal. Because Basil rules! You know, I think he could take over the world better than Pinky and the Brain. Narf!